Your Firework Screensaver download should start shortly. If downloading has not been started, use the following link to begin downloading an installer file: flaredance_setup.exe. Note: Windows XP Service Pack 2 may be blocking your firework screensaver download. The latest versions of Internet Explorer (Windows XP SP2) pop up a little yellow bar at the top of the screen that informs you a download has been blocked. To continue the download, you can right-click that information bar, and select "Allow this download". You may also click a large button at left side of the page. Note: Windows XP Service Pack 2 may be blocking your firework screensaver download. The latest versions of Internet Explorer (Windows XP SP2) pop up a little yellow bar at the top of the screen that informs you a download has been blocked. To continue the download, you can right-click that information bar, and select "Allow this download". 100% Virus-Free guaranteed We always take full virus detection on the files before we release our software to web server. 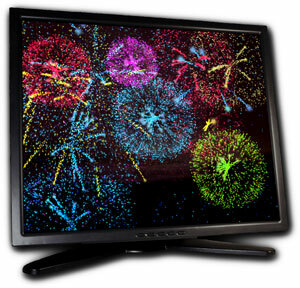 Buy online full Flaredance Firework Screensaver for only $14.95. We process orders with secure servers and all orders are backed by our unconditional 30-day moneyback guarantee. Copyright © 2005-2012 ZERGE.COM. All rights reserved.